I spent most of the weekend working on my scrapbook room. Ugh! I know . . . AGAIN! I’m NOT considering this part of the whole MAKEOVER thing, just the clean-up to get back to where I left off. If you look back at those last “makeover” photos from 10-15-09, I haven’t really made much overall progress since then anyway. What I did do, however, was perform a major backslide over the holidays. 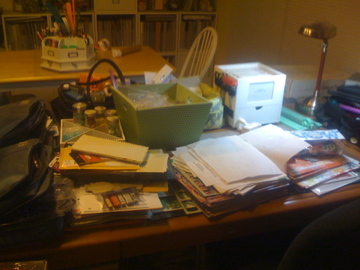 My scrap space became the activity center, the holiday gift-hiding and wrapping hub, and the dumping ground afterward for gifts to be put away, Christmas cards to sort and scrap, school and personal papers, etc. 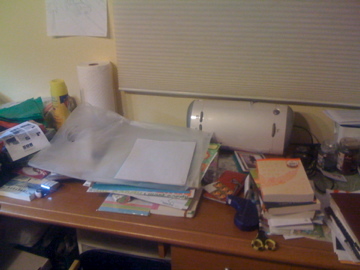 Everything had gotten WAY-HAY-HAY out of hand to the point that I couldn’t do ANYTHING on my desk or in my scrap space, much less scrapbook! While the ONLINE CROP happened this weekend, I spent some time sorting, purging, putting away, and cleaning my space, taking breaks to chat with the Scrap Sisters and keep my enthusiasm going. It’s now back to a decent level so I can scrapbook again (I have until Wednesday at midnight PST to complete some of those crop challenges!). Thought I’d share a few Before and After photos. The Before pix were taken Friday night so they’re dark, sorry. The Afters were taken Sunday afternoon. There’s my new Daisy tool caddy by Creative Memories. 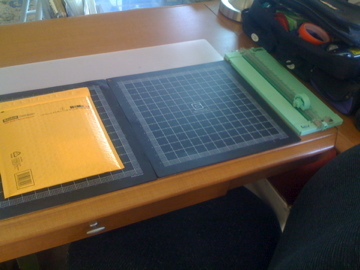 I moved all my acrylic stamps and inks from 2 Crop in Style flat packs into the tool caddy. What I realized is that … I need another one, LOL. I have my current stash in there, just barely, but my Secret Santa sent me a bunch more stamps for Christmas (they’re stacked under that pile of embellies, 5 full sets!). See all those punches and tools behind the tool caddy? I want to get one for those, too. I don’t like how they get dusty sitting out on my desk, even when they’re in heavy use … which admittedly, they haven’t been lately. The Cropper Hopper vertical file is for my newest acquisitions that I hope to scrap with soon. My Inspiration File, if you will. The rest is Secret Santa stuff that I left out on purpose. No, really! One of the crop challenges is to create a layout using products you received from Secret Santas. See, I wasn’t lying. Yes! I can see my Basic Grey magnetic mats again! The envelope has some CTMH “My Acrylix” (empty) envelopes that I offered to RAK on the Scrap Sisters Studio message board; as it happens, my Scrap Pal was the first to speak up so they’re being mailed to her … along with a little gift that I forgot to include in her Christmas gift mailing. Oh lookie! Some books that are now neatly filed on my bookshelf, which I also reorganized this weekend. My Green Tangerines bag and stuff I bought there, Christmas card leftovers and stamps, etc. 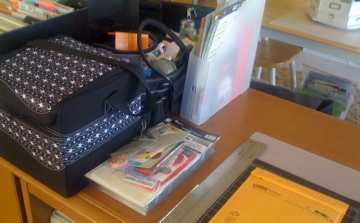 All my most-used tools, stereo, RAK bag, and carousel I use to store Cricut stuff. 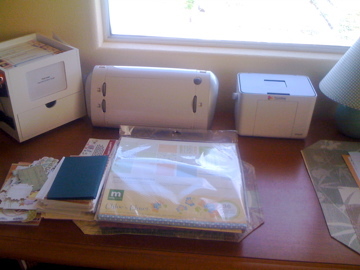 Cricut, Epson Picturemate printer, and I moved my little lamp over here. The paper, embellies, and envelopes are hand-me-downs from my mom (she’s the one who always gives me free scrap stuff she doesn’t want … I know, I’d be jealous if I were you, too). Anyway, I found the box they were in at the end of the day and that’s as far as they got :( Out of the box and onto my desk … for now. Yep, there’s really a couch and table under all that disgusting mess, I swear! CM photo storage boxes (like my fancy labels made out of sticky notes? i made new ones finally), an old printer I need to get rid of, and my basket of alphas. 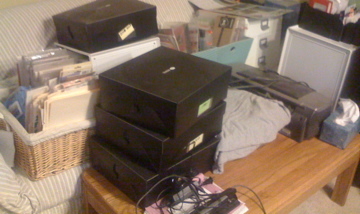 Also, 2 bins of past MEMORY WORKS kits that I need to either use or separate out and put away. So, there’s what I did this weekend. How about you? 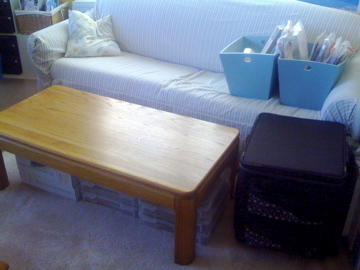 Anything scrappy or organize-y? Or did you just watch football? Whatever you did, hope it was a great one. Your space looks nice! I bet it will feel great to sit down and scrap in it! It looks great!! Isn’t there just something about the new year that makes you want to clean up and start over? I actually organized my scrap space last weekend and got to scrap in it this weekend without tripping over stuff. It was bliss! Great job! I just put all my scrap stuff into temporary storage, my sewing machine needed to stay out and the kitchen table just doesn’t do it! It got a little out of control before Christmas, but I did a tidy up/pack away/sort last week – nothing like a clear space to get the mojo flowing! Yes, the space is very ‘Donna Downey’s old room’ Turns out she was my inspiration and I didn’t even know it! I’d seen her space ages ago when I was looking at other people’s scrap spaces, loved it, but never remembered who it belonged to. Then when she re-did her space and someone posted the before and afters, I discovered whose room it was that I’d been jealous of! 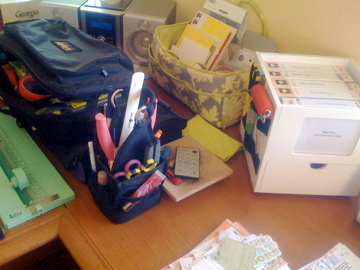 No matter, I’m thrilled with what I’ve got and I can actually find stuff now, which is a novel concept in a scraproom! Great job on your scrapbook room! I need to reorganize mine. Again. Just had a flood in my basement so everything is in boxes or up on blocks right now. Perfect opportunity to get it together I guess. I am soooooo not looking forward to it! I want your scrap room!! Good job on organizing I am still working on getting my little area all organized. It seems harder when you have a small space to work with.